Planning a wedding is notorious for being quite stressful, and they often end up costing more than they should. It doesn’t have to be that way though. 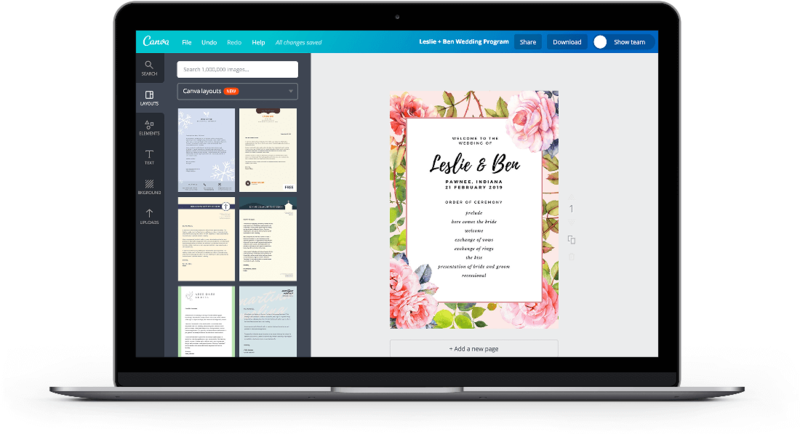 With Canva, save on the money and time it would take to hire a graphic designer and instead create your own fully-customized, perfectly personalized wedding program. Regardless of your wedding theme – be it rustic chic, vintage, Tuscan or inspired by Harry Potter – you can intuitively create a design that matches the theme. Take your pick of Canva’s collection of professionally-designed templates. From there, you can edit as much or as little as you want using Canva’s intuitive design interface. In a few minutes, you’ll have the perfect Wedding Program for your big day, freeing you up to focus on all the other important stuff! Create a new Canva account to get started with your own Wedding Program designs. Wedding budgets can run out of control, which is why it is good to know you can still get some things done for nothing. With heaps of free templates, images, fonts and other cool design elements to choose from, you are spoilt for choice. Premium design elements like images or icons are only at $1 for each one time use. Designed by our team of in-house designers they could be just the inspiration you need. Then drag and drop, tweak a font here, adjust a color there and before you know it you’ll have your very own personalized wedding program. Creating a wedding program is a way of thanking everyone who made it possible, letting guests know who’s who in the wedding party and what they can expect from the day ahead. It is also the perfect keepsake for your day. Make sure you have all the right information in your wedding program by using the “Share” button to email your work in progress directly to anyone who needs to input. Invite them to edit, comment and get it looking just so. Not a fan of a cookie cutter wedding? We aren’t either. Making your wedding program totally different is as easy as uploading your high res photographs, designs and illustrations. Not only is it free, once they are in Canva you can use them as many times as you like. Don’t have ready photos? That’s okay, Canva’s amazing media library – containing more than a million stock images, icons and illustrations – has you covered. Browse through various categories or search for specific images. Whatever it is you need, Canva’s media library contains only high quality design elements so your design will always look good, whether on print or on screen. Can I collaborate with my friends and family on my design? You sure can. To allow a friend or family member to edit your wedding program, tick the box next to “Share/email as an editable design”. This will give them access to edit your design in their personal Canva account. Where can I find inspiration for my Wedding Program design? Our library is packed with awesome examples of Wedding Programs created by professional designers. If you’re stuck for inspiration, these layouts are a great place to start!